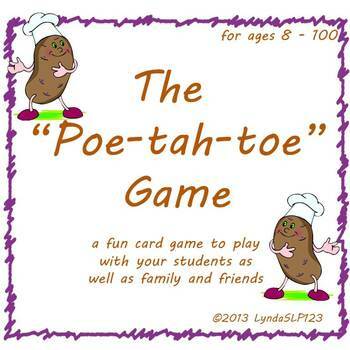 The Poe-tah-toe Game is a fun, original, open-ended card game for ages 8 to 100. Play Poe-tah-toe with your students! Play Poe-tah-toe with your family! Play Poe-tah-toe with your friends! Play Poe-tah-toe while you review any educational skill (articulation, language tasks, vocabulary review, math fact drills, answering questions, etc.). Poe-tah-toe is a great game for targeting social skills - eye contact, turn-taking, good sportsmanship, following rules, etc. Poe-tah-toe will give students the motivation to practice, practice, practice while having fun. 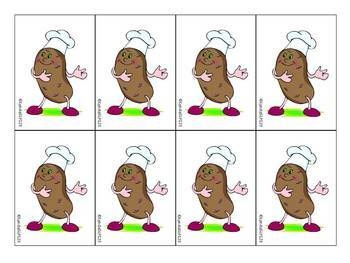 Try to be the first person to collect 2 of each type of potato (baked, fries, chips, or mashed). 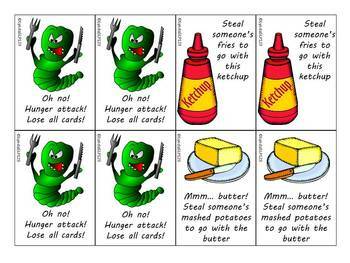 It's not that easy when friends play action cards to steal your fries or mashed potatoes. Watch out for the hungry worm card -- he'll eat all of your potatoes! This original game was created by LyndaSLP123 and her wonderful family. The story behind this game: When my son was 12, he inspired the creation of this game. He thinks it's funny to call potatoes "POE-tah-toes" and he dared me to make a card games using "poe-tah-toes". The Poe-tah-toe Game is the result of that dare (and a lot of brainstorming with my family). I hope you and your students (or family or friends) enjoy it as much as my family has.